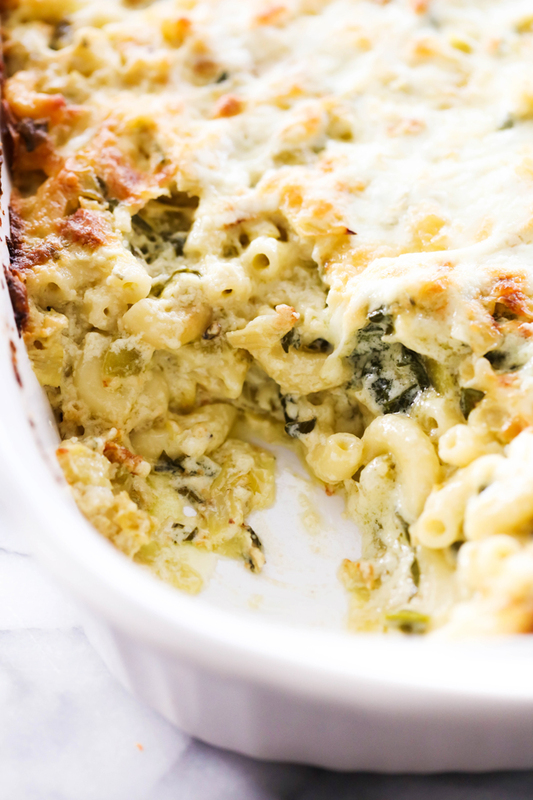 This Spinach Artichoke Mac and Cheese is full of flavor and is loaded with cheesy creamy goodness. This is a fun spin off from the classic spinach artichoke dip and will be a dinner that the whole family will love. Spinach and artichoke is one of my favorite savory flavor combinations. 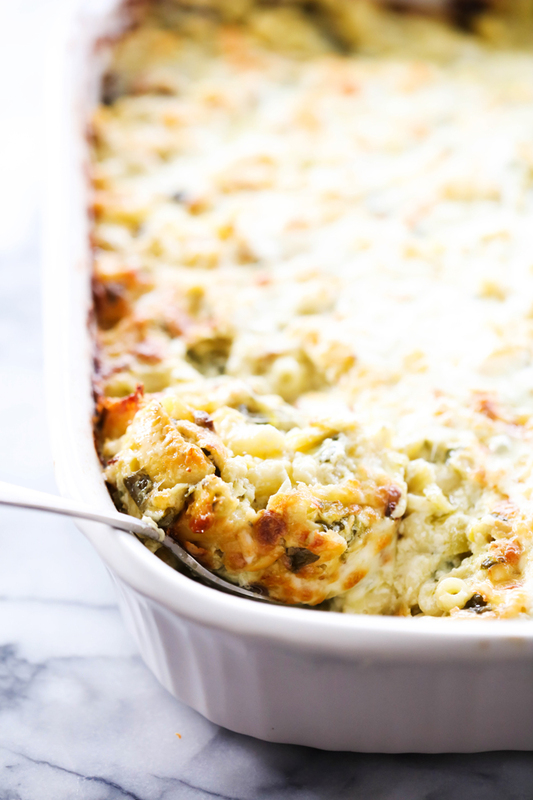 This dip tastes like Spinach Artichoke Dip but in dinner form. This meal is cheesy, creamy and fully of flavor! In a large bowl mix cream cheese, 2 cups mozzarella, and Parmesan cheese. Stir in heavy cream and green chilies. Add spinach, artichokes, salt, pepper, cayenne pepper, Worcestershire sauce, and lemon juice. The milk ingredient is optional if you need it. I sometimes add a little bit more milk if it seems dry. Remember, pasta absorbs the moisture so its better to have it a bit runnier than you think it should be. Add artichokes mixture to noodles and spread in a 9x13 baking dish. Bake for 40 minutes or until hot all the way through. Sprinkle remaining cheese over mac and cheese and return to the oven for 5 more minutes. I fixed this for supper tonight and it is delicious! Hubby likes better than regular mac n cheese. Can't wait to try the leftovers, thank you for another yummy recipe! I made this for dinner yesterday and it was an instant hit at our house. My wife took some for lunch today and she called from work to tell me that the leftovers were even better than the original. This recipe has gone directly to the list of choices in my Menu Planner...it's a definite keeper. Your 1/4 teaspoon of Cheyene should be Cayanne Pepper, should it not? Spinach should be defrosted and squeezed of juice or just raw fresh spinach?